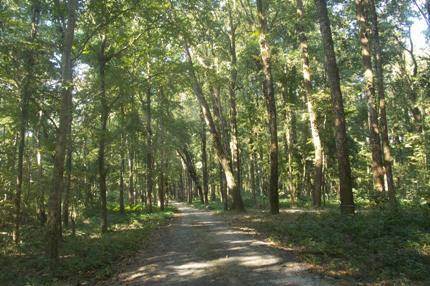 Mahananda Wildlife Sanctuary is a reserved forest area that initially started as a game sanctuary where children took rides. The entrance to the sanctuary is located at Sukna which is about two & half hours drive from Darjeeling. If you are coming from New Jalpaiguri (NJP), it takes about 45 minutes to reach the gate. The sanctuary is spread over varying elevations and across 158 sq. km of forest area. The altitude varies from 500ft. at the southern area near Sukna and rising up to 4,300ft towards the northern area near a place called Latpanchar. 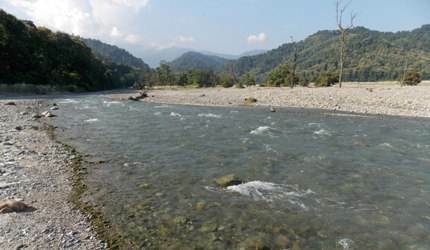 On the east the sanctuary is bounded by the river Teesta and on the west by the Mahanadi river and Hill Cart Road. The sanctuary is managed by Darjeeling Wildlife Division of Government of West Bengal. It is considered as the most important sanctuary of North Bengal. There are several forest villages that are part of the sanctuary including Kalijhora, Latpanchor, Punding, Sukna, Gulma, Toribari, Sevoke, Seventh Mile and Latlong. However the main entrance to the sanctuary is from Sukna (the gate is located near the Sukna toy train station and about 30 minutes from Siliguri). If you drive straight down the main forest road, you will reach the banks of Mahananda river on which the sanctuary has been so named. The stream with mountains at the backdrop is a picturesque place. When we reached the river, the guide pointed towards the hill straight ahead at the opposite bank and said that the small hamlet Latpanchar is just on the other side of the hill. 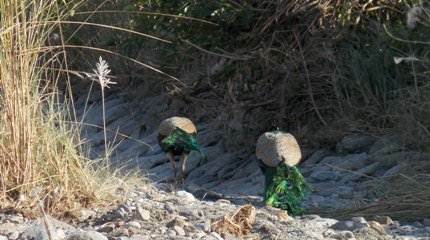 Regular day safaris are offered in the sanctuary from the Sukna gate both in the morning and in the afternoon. However no vehicles are provided. You need to come with your own car, buy entry tickets, pay for a guide and camera, and get going. The total distance in the usual safari route is 8kms out of which 2kms is unpaved or dirt road. If you plan to enter the forest and take the safari, I suggest that you bring a large vehicle as the unpaved mountain pathways through the jungle will be difficult to negotiate with a small car. Petrol cars are preferred as they make less noise. It takes about 2 to 2.5 hours to complete the circuit. You need to come out before it's dark. Update October 2014: Elephant rides were earlier offered at the Sukna forest area located at the terai region. However such rides are no longer offered at Mahananda Wildlife Sanctuary. The person at the counter (Sharma working for over 2 decades) mentioned that the wild elephants sometimes get into conflict with the elephants doing the rides and start chasing them. In couple of occasions, elephants with tourists on their back were panicked and started to run creating huge risks for the tourists. In one occasion tourists taking the ride were about to fall off. The rides have been discontinued since then. There are 330 different types of plantations that have been recorded in the sanctuary. Amongst forest plantation you will see khair, sisoo, simul and tropical sal forests. Other major plantations includes teak, udal, champ, lali, jarul, gamar, mandane, bamboos, ferns, orchids, sidha etc. There are large grassy areas as well. If you are lucky you can even spot Royal Bengal Tigers in this sanctuary. As per the 2003 census, there are at least 14 such majestic creatures in the jungles here. And there are lots of other animals and reptiles that you can see. Some 36 different species of mammals exist in this sanctuary including Himalayan black bear, leopards, rare mountain goats (serow), porcupines, golden cats, sambar, spotted & barking deer, Indian bison (gaur), wild boars, monkeys including black capped languor etc. Mahananda Wildlife Sanctuary is also a haven for the bird watchers. There are 243 different species of birds having been spotted in this sanctuary including ones like Himalayan pied hornbills, peafowls, peacocks, fouls, egrets, king fishers, fly catchers, racket tail drongo, Assamese macaque, robins, woodpeckers and lot more. Large number of migratory birds arrive here from central Asia. There are several open areas or glades in the sanctuary where artificial saltlicks are created. The animals come there for licking salt. This is one way the animals fulfil their mineral requirements. Animals usually come to the glades in the morning and evening. Several great watch towers have been set up in the sanctuary. There is one in Laltong on the Teesta river bank near the Laltong village which is great for watching elephant migration. 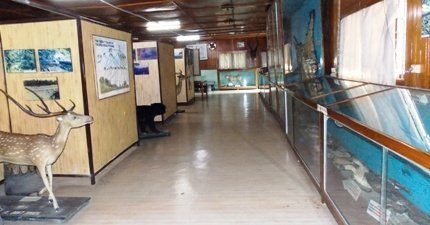 The second one is in the abandoned Gulma railway station created using a train's cabin and is great for watching deer, Indian bison and other animals. There are three other watch towers. The one at Toribari is great for bird watching. 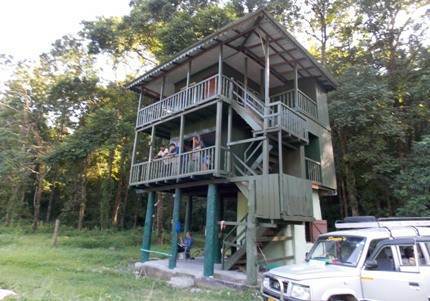 Another tower is in Golaghat and about 5kms from Sukna which is great for watching wildlife. One of my favorite watch towers is near the bank of Mahananda river and overlooking the stream and the dense forest beyond and around the tower. The tower area is fenced with electrical wires with live currents to keep away the animals from entering. When I asked, the person on duty at the tower mentioned that he is on duty 24 hours and 365 days. He sleeps in the tower itself. His job is to look for the animals around and report, also to shove away villagers who come there to cut the trees. The second level of the tower has seats with lovely views all around including the dense jungle, the mountains and the river. You can spend hours sitting there. 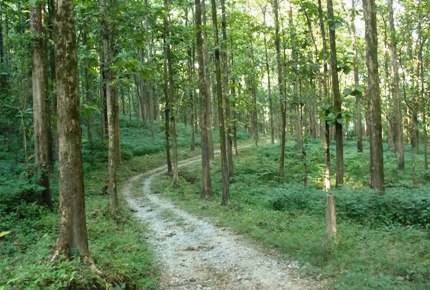 The state government has been encouraging Eco tourism in the sanctuary that involves villagers from 11 villages including several forest villages. The villagers help to conserve the bio-diversity of the forests and protect the wildlife. Many of them have been engaged as guides to the tourists. The village girls participate in ethnic cultural dance and music to entertain the tourists. A stairway from the right goes upstairs to the museum. At the entrance, you will find a preserved leopard in a glass cabinet. It was killed in the sanctuary, and in its belly small cubs were found which have been preserved right next to it. There are large many exhibits and artifacts here that reflect the flora and fauna of the jungle including preserved skins of tigers, heads of deer & bison, birds etc. But one of the most striking exhibits is the preserved cub of an elephant at one end of the room. It was found in the jungle in 1998. Next to it is a huge Royal Bengal Tiger. Just in case you are thinking about overnight stay in the sanctuary, there is a Forest Lodge run by the state forest department in Sukna area few yards inside the jungle but before the main entry gate (in the southern lower region). There is another forest rest house and several other private lodges & homestays in Latpanchar which is in the northern area of the sanctuary at a higher elevation. Divisional Forest Officer, Wildlife Division - I, Darjeeling. You will need to make your own food arrangement. If you bring all ingredients, the caretaker can help and cook the food for you. Sukna forest lodge is located conveniently and you can walk down to the township for provisions. However the Latpanchar lodge is completely isolated and inside the jungle. Latpanchar is a great little hamlet at 4,200ft altitude offering wonderful natural surroundings including marvelous views of the Kanchenjunga snow peaks and an ideal place for bird watching. Latpanchar is about 44kms from Silliguri and is part of Mahananda Wildlife Sanctuary. However the there is a separate route from Sevoke Road of Siliguri to access Latpanchar. Visit Latpanchar to know about the village itself, accommodations and what to expect when you access that part of the sanctuary. November to April is the best time to visit Mahananda Wildlife Sanctuary. This is when the sky remains clear and temperature mild to cold. October is also fine. Note that the Sanctuary remains closed from June 16th to September 15th every year as this is the monsoon time and the breeding season for animals. You can not enter the forest during this period. Guide: Rs. 150/-; Vehicle: Rs 100/-; Camera: Rs. 100 per camera. The entrance to Mahananda Wildlife Sanctuary (for the Jeep safari) is at Sukna which is 8kms north of Siliguri (14kms from NJP) on Hill Cart Road. The gate is near the Toy Train station at Sukna. From Darjeeling, it's about 2.5 hours downhill drive along Hill Cart Road. Via Simulbarie, it will take about 3 hours from Darjeeling. For a day trip from Darjeeling, hire a cab for the day from the club side taxi stand (near Gandhi Road police chowk). Rates vary... a small private car may take Rs. 2700 - 3000 for a round trip. If you are heading for Latpanchar, you will get vehicles from NJP/Siliguri (Rs. 1500/- approx for a drop). 1) Check out Day Trips from Darjeeling for many other great day tours from Darjeeling. 3) Check out Darjeeling Tours to know about many other wonderful places that you can visit from Darjeeling within hours. It is nowhere near Sevok Coronation bridge. Sukna gate is on Hill cart road on the way to Kurseong. It's about 13kms from NJP station and will take about 35 minutes by car. Hello. We are planning to visit Darjeeling and Mahananda wild life sanctuary and we are planning to stay in Latpanchor. Can we avail the jungle safari from there? or do we need to come to Sukna for it? Please do reply as we are scheduled to visit on 24th of this February and we will be planning our stay according to your response. Hi, there is no jungle safari available at Latpanchar. Guides are however available to take you to the forest. Prepare to walk for several kilometers. At Sukna too, they will provide guides but you can take your own vehicle (preferably a jeep, sumo etc) for a two hours safari along with the guide (total covered distance inside the forest is about 8 kms). Small cars can't get into the dirt road and therefore you won't be able to see a good part of the jungle with a small car. The sanctuary office doesn't provide jeeps these days. So when you take a vehicle from Darjeeling or NJP, plan it out with the driver. In a Sumo, he should take about Rs. 500/- extra for the safari. Hi, You should reach the lodge during the day time. If you reach in the morning hours, you can book a room (subject to availability) and then go for the safari. 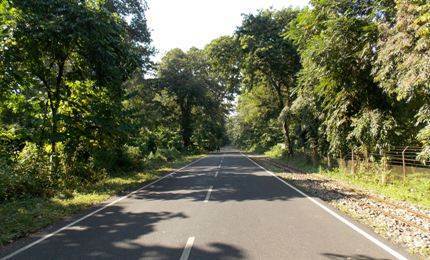 For booking in advance, contact WB Forest Development Corporation and they can guide. You need to make your own food arrangements. If you bring vegetables and other raw materials, the caretaker can cook for you. To reach Latpanchar from Darjeeling, take the Hill Cart Road (NH 55) and about 20 minutes before Kurseong take the uphill road at Dilaram towards left. You will reach Bagora and the road continues to Latpanchar and beyond. Dear Raj, Thank you for the detailed information. Assuming that we do not get rooms in the Government Forest Lodge, which is the nearest hotel you would recommend where one can stay. We are a family of four. Stay in Siliguri. Sukna gate is a short distance from there (about 17kms). Hotel Raj Darbar on Hill Cart Road is a good choice in budget/mid-range category. Thanks raj, there is just one info that I could not find on that link. How to book safari? Is it done only on the spot? Yes, if jeeps are available you can book the safari on the spot near Sukna gate. You can take your own car inside as well and just pay for the guide. Hi, I wanted to visit Mahananda Wildlife Sanctuary. Will it be convenient to visit it from Darjeeling or from NJP? Which one will you recommend? And is jeep safari available for the sanctuary? I'll visit it around 15th December, will it be open at that time? Sukna gate of the Sanctuary is much closer to NJP than Darjeeling. So go from NJP. The sanctuary remains open in December and jeep safaris are usually available. Very informative write up on Mahananda WLS. I had the privilege to stay at Sukna and at Latpanchor for one night each on two different occasions in between 2008 & 2010. But the booking was on spot and after several pleadings and folding of hands to the local administrator. I'm a birder and a bird photographer and would certainly prefer to obtain prior sanction from the DFO. But accessing the official is very tough here in West Bengal and more often than not your requests are turned down. This certainly frustrates. I've seen and photographed giant squirrel, verditer flycatcher, blue fronted redstart, long tailed thrush and a lot of tiny butterflies at Latpanchor. And the location of the FRH is simply breathtaking! The fur avenue that leads to the bungalow is a real treat for a connoisseur's eyes. With Mahananda flowing through the jungle Sukna has a different appeal altogether. Its nature interpretation center and that beautiful watchtower adds to the attraction. At the break of dawn in May a flock of oriental pied hornbills flew in and settled on a big tree! And my heart leaped in ecstasy. I wish I could go back there and stay two nights in peace if only the booking could be hassle free. Thanks.